I have made a port for Android devices of my entry: My Mini Castle! Type|FACE was our first LD Jam, and it went really well. We’ll certainly be back for another go at it! This team had never worked together before, and so naturally we’re very proud of what we managed to create. 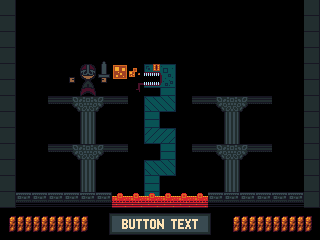 Most importantly, we’re going to continue to work on Type|FACE and turn it into a fully featured game. This is by far the greatest gift that the LD competition has given us. We didn’t waste any time moaning about the theme, even though we all knew it wasn’t what we were hoping for. We took the theme as a challenge and tried our best to match our skill sets to what we thought would be a fun game. We agreed upon a deadline for a game idea. This prevented us from wasting too much time throwing around crazy ideas, leaving not enough time to implement them. We quickly formulated a few ideas, and took a vote. From there, we did a good job planning out what we needed from just a handful of game sketches and quick chats. Once we had a plan, we kept a very close eye on our priorities as the project progressed. We did things in the right order, and built up the game in logical chunks. No feature creep! We were ruthless on feature creep. Did the game need a particular feature to be a game? If it didn’t, it was quickly culled. Our music guy was excellent – with only the smallest amount of direction we got a perfect track in a small amount of time. Easily the single biggest ‘bang for buck’ in the project. We worked hard to get a playable build up and running as soon as possible. The game was fully playable on the morning of day 2. While we did work hard, we were also careful not to get too stressed. We ate properly, took breaks and had a proper sleep pattern. We knew we’d be more productive this way. Unexpected sickness! Our lead coder was hit with a serious migraine on the final day. This meant we had to cut some features that we considered essential. Naturally this was very disappointing, but we’re still proud of what we achieved in the time. The only way to mitigate this is for other members of the team to become more multi-skilled – leading to our next point. The original intention was that our designer, Chris, would be able to pick up some of the slack coding simpler ancillary features in the game. However, due to the nature of the game, Chris wasn’t really able to do much code wise in this project. Hopefully in a more ‘traditional’ game, and with more experience, we hope this will balance out in time. All of the team were in the same flat in Sweden, except for Chris who is UK based. While Skype, Google Drive and Subversion make it pretty easy to work this way, there are limits. The most obvious example being the limited interaction between Chris and Anton, the artist on the project. If they had been in the same room, ideas could have been conveyed much faster, and it would have given them both more to do during down time, while waiting for critical features to be implemented. Next time, we will make sure to all work from the same location. Not enough blogging! After finishing the game and looking back over what we had done – we realised we had documented nearly none of the creation. While this didn’t directly effect the game, it’s a real shame we don’t have more to look back upon during the creation of the game. Next time, we’ll make sure to make much more frequent updates, take pictures and generally contribute to the community at large. Not everyone in the project had Visual Studio, meaning one of the coders would have to copy out builds every now and then for testing. The project was small, and this wasn’t a massive hardship. However next time it would be worth the time automating the process to maximize time spent actually developing the game. And so ends my first Ludum Dare. It was a challenging experience, especially since I didn’t have as much time to work on it than I had originally hoped. My plans changed a lot throughout the competition. I’d like to highlight the biggest changes. My original plan was to submit my game into the 48 hour competition, but I ended up needing more time, so I submitted it to the 72 Jam instead. I hope to make an entry to the 48 hour competition next time. I did not add sound. This had to be cut in order to meet the 72 hour deadline. I code generated shapes rather then art. I made this decision after the theme was announced, since to me it showed minimalism. I chose to make an infinite runner game instead of a roguelike. I ended up making this change almost as soon as the theme was announced, since I felt I could achieve this, and my top objective was to get something I could submit. I ended up using OpenGL as well as SDL, since I knew it would fit well with my level generation. I did not know how to do this in SDL, and with a little research I realized it would require one of the extra SDL libraries. This could have been a bad decision, since I didn’t have any experience making a game with OpenGL, but I believe I learned a lot because of this decision. This wraps up my thoughts so far. I might make another post after I get the results back. I’m hoping to get at least 2’s or 3’s, and maybe get some insight from comments. …I (somehow) managed to arrive five hours before the Compo ended and I managed to finish a very, very small game about 20 seconds before the countdown ended. This is a game about perception. How can we perceive objects and figures no matter how minimal the resolution is. There’s not much to explain, just go and play it, play it, play it. Night 0 – First Playable Demo? Yes, the demo looks nothing like the mockup. Yes it is just a Main Menu with dynamically-sized buttons that blink and beep, and a terrible looping honk-song made in about a minute. But we’re building the entire engine from scratch here, and it’s pretty wee-hoursy. For now, it is time to snooze. MORE PROGRESS ON THE MORROW! So I’ve decided on my idea, like many others from the looks of it I wasn’t too inspired with “Minimalist” but I’ve decided to try something that I would feel fits the theme, meaning it’s very simple but I’ll try and make it as varied and big as I can Images to come later. 29 queries executed in 0.125 seconds.